The facilities at Oak Crest Institute of Science are housed in a building of approximately 10,000 ft2, and are arranged in an open-planning design as well as dedicated laboratories. The following infrastructure is available to researchers. Atmospheric Chemistry and Aerosol Research Laboratory.The atmospheric chemistry and aerosol research facility houses equipment and instrumentation for the generation and measurement of gas-phase and aerosol standards in the laboratory, and for the collection and analysis of environmental gas and aerosol samples in the field. Biomedical R&D Facilities. The biomedical laboratory is housed in a dedicated facility and includes a pilot-scale manufacturing space as well as a hard-wall class 10,000 clean room. Chromatography. Oak Crest’s chromatography laboratory provides a wide array of liquid and gas chromatographic techniques including HPLC and LC-MS, ion chromatography, and GC and GC-MS.
Electrochemistry. Electrochemical measurements including cyclic and linear-sweep voltammetry are carried out using both digital and analog potentiostats. 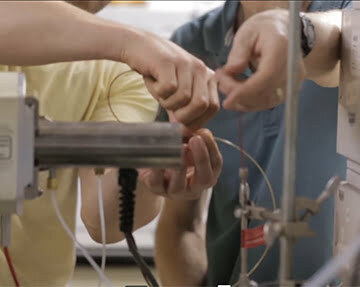 Modular instrumentation and software written in-house allows for both routine use of standard electrochemical techniques and the rapid development of new methods. Imaging Core. 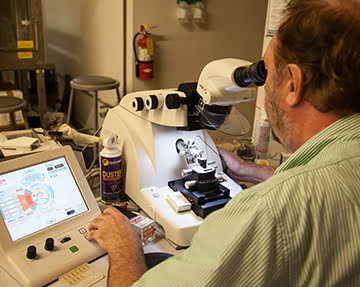 The Imaging Core is a resource for microscopy applications, specialized preparation techniques, immunolabeling, and the expertise to guide and troubleshoot biomedical and environmental research projects to seamlessly integrate imaging data. Instrumentation Development Facility. Oak Crest’s instrumentation facility allows development of novel instruments for laboratory and field-based spectroscopic measurements, medical devices, and other custom laboratory equipment and instrumentation. The facility includes an electronics design and assembly laboratory and a fully-equipped machine shop for mechanical fabrication. Laser Laboratory. The laser spectroscopy laboratory provides facilities for laser-based ground and excited-state spectroscopic techniques. Microbiology Laboratory. The dedicated microbiology laboratory provides facilities for sample preparation, growth and isolation, including a separate anaerobic culture laboratory. Molecular Biology Laboratory. The molecular biology laboratory is housed in a dedicated facility and includes equipment and instrumentation for DNA and RNA isolation and purification. Separate, dedicated laboratories include facilities for proteomics and metagenomics, as well as a high-throughput sample processing facility. Spectroscopy. 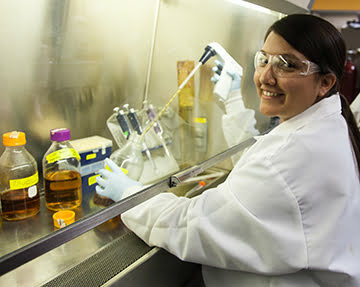 A broad array of spectroscopic techniques are available at Oak Crest, including UV-visible and infrared absorption spectroscopy, fluorescence spectroscopy, Raman spectroscopy, and multi-nuclear NMR spectroscopy. Tissue Culture Laboratories. Two tissue culture facilities are available at Oak Crest, each supplied with HEPA-filtered air, one for sterile culture and another BSL-2 facility where bacteria and viruses can be studied alongside human cell lines. Wet and Synthetic Chemistry Laboratories. Facilities for synthetic chemistry are located in a large, open=planning wet-lab space that is fully-equipped for carrying out traditional bench-top chemical synthesis, vacuum-lines and glove-box based inert atmosphere chemistry, and gas-phase chemical reactions.